KANSAS CITY, MO. (August 5, 2015) - The Anaheim Regional Transportation Intermodal Center Project was recently named a 2015 Public Works Project of the Year by the American Public Works Association (APWA). This year, the team of winners includes the City of Anaheim, California as the managing agency; Clark Construction as the primary contractor; and Parsons Brinckerhoff with HOK as the primary consultant. These organizations will be presented with the award during APWA’s 2015 International Public Works Congress & Exposition Awards Ceremony in Phoenix, Arizona during August 30-September 2, 2015. The APWA Public Works Projects of the Year awards are presented annually to promote excellence in the management and administration of public works projects, recognizing the alliance between the managing agency, contractor, consultant and their cooperative achievements. APWA selected projects in five categories: Disaster/Emergency, Environment, Historical Restoration, Structures and Transportation. The Anaheim Regional Transportation Intermodal Center Project is being awarded the Project of the Year Award in the Structures category, at a cost greater than $75 million. 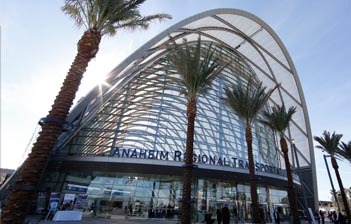 The Anaheim Regional Transportation Intermodal Center (ARTIC) is the first LEED Platinum-designed transit station in the world, and is a significant vision of public transportation infrastructure. Located in the heart of Orange County, next to the world-class Honda Center and Angel Stadium of Anaheim, ARTIC is a 120-foot tall, 67,000-square-foot transportation hub and mixed-use activity center. Immediately upon opening in December 2014, the facility increased mobility options for 3 million Orange County residents and more than 40 million visitors annually, and is a model for energy efficiency that also promotes sustainable living. An array of transportation services includes Orange County Transportation Authority (OCTA) bus service, a regional commuter rail system — Metrolink, Amtrak, Anaheim Resort Transportation (ART), shuttles, taxis, bikes, tour and charter buses and other public/private transportation providers. ARTIC also includes bike lockers, electric vehicle charging stations, a self-service book vending station, Wi-Fi, forthcoming restaurants and approximately 1,100 parking spaces. Though ARTIC's 67,000 square-foot terminal resembles a grand 19th century rail station, the catenary curving structure's design and construction was anything but antiquated. The project team collaborated using multiple BIM models during the submittal process, including models for the structural steel, curtain wall, and diamond-shaped ETFE roof that reduced these systems to the simplest geographic elements: 10,500 geopoints provided to 7 decimal places and arcs. These "geogrid" models conveyed the shell's exact design dimensions and, when overlaid, revealed miniscule alignment gaps along the structure's curves that would have resulted in delays, rework, and additional costs during construction. Through this cutting-edge virtual collaboration process, ARTIC's project team was able to precisely design and coordinate the structural steel, two complex hanging curtain wall systems and the ETFE components prior to fabrication and field installation that would normally require field verification dimensions. Due to the project’s location close to the Santa Ana River trail, a geotechnical investigation was performed to determine foundation construction that would support the iconic steel structure and prohibit liquefaction. The design solution required the use of the Deep Dynamic Compaction (DDC) method beneath a mat slab foundation. . The DDC process required the excavation of a moat around the area of the compaction to absorb the vibration and minimize impacts to surrounding structures from the compaction activity. For more information on the APWA 2015 Projects of the Year, please contact APWA Media Relations and Communications Manager, Laura Bynum, lbynum@apwa.net, or call 202.218.6736.